An adult human being has 32 teeth and all these have their names which are given based on their set, arch, class, type and side. There are two set of teeth in human beings, one set is primary or baby teeth and permanent or adult teeth. The set of teeth that replaces primary teeth are called succedaneous or permanent dentition which is a group name. Teeth Names are also given depending on the arch a tooth is found in; maxillary is the name given to the teeth in the upper jaw and mandibular to those in the lower jaw. There are four classes of teeth namely: incisors, canines, premolars and wisdom teeth. Children teeth otherwise known as deciduous teeth also have the same names except wisdom teeth which normally come out at the age of eighteen. The upper teeth of the adult have the following names: central incisors, lateral incisors, canine (cuspid), first premolar (first bicuspid), second premolar (second bicuspid), first molar, second molar, third molar (wisdom teeth). The lower teeth consist of third molar (wisdom teeth), second molar, first molar, second premolar (first bicuspid), canine (cuspid), lateral incisor and nuclear incisor. In addition, baby teeth also have their names which include the following upper teeth: central incisor, lateral incisor, canine (cuspid), first molar and second molar. The lower teeth names are: second molar, first molar, canine (cuspid) lateral incisor and central incisor. 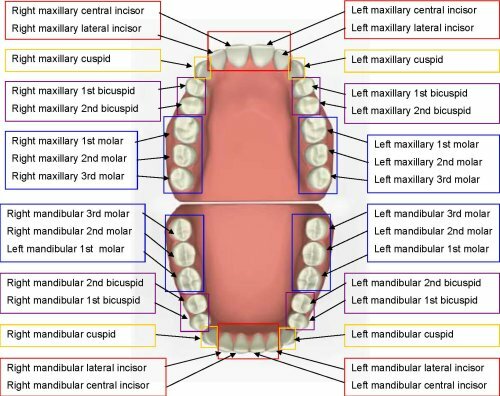 Teeth names locations are in each quadrant of the mouth. Each of the quadrants contains 8 permanent teeth namely: 2 incisors, 1 cuspid, 2 bicuspids and 3 molars. The central incisor is located to the side of the midline because it is centrally placed in the arch. Beside the central incisor is the lateral incisor. It is followed by the cuspid and the two bicuspid (the first and the second bicuspid). The last three molars followed the second bicuspid. Also, teeth are located by referring to them as either anterior or posterior. The anterior teeth are located in the front of the mouth (the incisors and the cuspids). They are also visible when a person smiles. On the other hand the posterior teeth are located at the back of the mouth (bicuspids and molars). To facilitate easy identification of each tooth, the names and numbers are not enough, each tooth need to be identified through the quadrant it belongs. Teeth names in human mouth are given according to their anatomic shape or letter or number. Their names should be recognized fully to avoid confusion and to facilitate quality dental care (for example, right mandibular second molar). Given that there are four second molars, naming the quadrant (right mandibular) which specifies the second molar makes it easy to recognize. The human teeth are arranged symmetrically in the mouth and it is possible to know them by names. Read more about human teeth names and their functions in this post. Dentists have designated each tooth with name hence, teeth names in English. Cuspids are synonymous with canines while bicuspids are also known as premolars. Six year molar is also called first permanent molar. The twelve year molar is used synonymously with second permanent molar while the wisdom teeth (so called because of their late eruption) are called third molars. The teeth in the front of the mouth such as incisors, lateral incisors and canines are called anterior teeth. Posterior teeth comprise of teeth located in the back of the mouth and they are known as premolars and molars. The mandibular is the name given to the teeth in the lower jaw, while maxillary is the group name of the teeth in the upper jaw. Teeth name position in the mouth makes it easier for the dentists to identify them for treatment. The shapes of the teeth help in positioning them. Teeth are given names by the positions they occupy in the mouth. Each of these teeth is either positioned in the lower jaw or upper jaw. Those who are in the lower jaw are known as mandibular and those in the upper jaw are identified as maxillary. Also, the side of the face (i.e. right or left) the teeth are positioned determines their names. The maxillary incisor is positioned distally from both maxillary central incisors of the mouth and mesially from both maxillary canines. Mandibular central incisor is situated in the jaw adjacent to the midline of the face. The mandibular lateral incisor is placed distally from both mandibular central incisor and mesially from mandibular canine. The maxillary and mandibular canines are positioned three teeth from the midline and they separate the premolar from the incisors. The maxillary canines are put laterally away from maxillary lateral incisors and mesially form maxillary first premolar. Human teeth names are associated with their functions. The teeth are categorized into four; they have typical appearance and perform specific option. They perform these functions according to their shapes and morphology. Human species are omnivorous because they eat both plant and meat and this particular characteristic demands two specific types of teeth namely; incisors also referred to as cutting teeth are used to cut foods into smaller pieces to facilitate inward movement into the mouth. In this type are also canines which are also known as eye teeth or cuspids, they have sharp and pointed edges which are used for chewing and grinding, they can also pierce and rip at edge of the cusps. The most important function is that they start grinding the foods before transferring it to the molars for final grinding and swallowing. The work of the dentist is made simpler because of the teeth names which are associated with their functions. More detailed information and facts about human teeth names and their functions is available in this post.